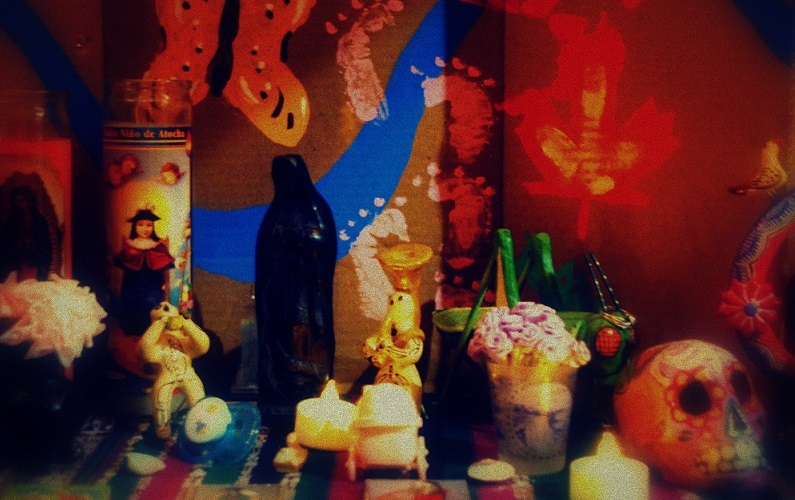 Ofrenda por la niña Marisol Nola. next to their abuelos and primos. to warm them in their graves. music, food and cempasúchil flowers decorate the graves. "There's a room for rent here. Cheap!" A space for me and you? after we've walked down more roads together. Día de los Muertos...Mexico's Day of the Dead is not just one day, it is two days. November 1 — All Saints' Day — is set aside for honoring the passing of children. The following day, departed adults are recalled. Today, we remember the children through this poem by Teresa Puente and los niños brief time on Earth and in the womb. Teresa Puente is a Professor of Journalism at Columbia College in Chicago and writes about Hispanic issues at Chicanisima. Ms. Puente also encourages Latina women to write and publish their own stories in Latina Voices. Life and Death originally appeared in Take Two: Another Anthology of English Writing from the Costalegre and appears here with the author's permission.